For a first-time snorkeler, there’s no better place to explore Hawaii’s depths than Kuilima Cove. Located on Oahu’s northernmost tip, Kuilima Cove is well cared for and popular with visitors and locals alike. Its smooth white sand and calm waters make it a great place for families to spend the day exploring its ocean depths. Keep your eyes peeled for Humuhumunukunukuapuaa, our beloved state fish! Situated on Oahu’s beautiful North Shore, Shark’s Cove is one of the most popular diving and snorkeling destinations in the world. Despite its relatively rocky shore, Shark’s Cove is nonetheless adored for its blue waters teeming with schools of fish. Keep in mind that the currents here are strong, and may not be suitable for children or beginners. Electric Beach in one word? Visibility! Electric Beach is a local favorite for scuba diving, swimming and, of course, snorkeling. While its official name is Kahe Point Beach, this west side snorkel spot gets its nickname from the nearby electric power plant that works to warm the surrounding waters and thereby attract a wide array of underwater creatures. Of course, no snorkel adventure on Oahu is complete without a stop at Hanauma Bay. This east side bay is a gorgeous and tame snorkel spot perfect for visitors, families and all lovers of the ocean. Its clear visibility and large fish population are just some of the selling points that make Hanauma Bay one of the most popular ocean destinations in Hawaii. As a protected marine life conservation area, Hanauma Bay is closed to visitors every Tuesday to allow the fish one day of rest. Our top snorkeling spot? Well, that’s a secret. You’ll need to join us on our Wild Dolphin Watch, BBQ & Snorkel cruise to find out! Following a leisurely afternoon cruise and delicious BBQ lunch, you’ll be treated to a snorkeling experience you’ll never forget. We provide you with the equipment and instructions you need to spot Hawaiian reef fish, coral beds and more. We offer this cruise daily from noon to 3PM. To book your Wild Dolphin Watch, BBQ & Snorkel cruise today, call (888) 373-2556 or visit Dolphin-Star.com. Summer is in full swing and you know what that means? It’s the best time for snorkeling! Climb aboard the Dolphin Star and enjoy our cruise that combines a dolphin watch, lunch and snorkeling at our secret reef spot in crystal clear waters. We caught up with Captain Wade Matsueda of the Dolphin Star to see what makes the Wild Dolphin Watch BBQ & Snorkel so special. Check our Q&A with him below! Q: Where do your summer snorkel cruises go? A: Our Dolphin Star vessel departs from the centrally located Wai‘anae Boat Harbor allowing us the flexibility to cruise towards Ka‘ena Point or Ko Olina. Depending on the sea conditions, our Captain will determine the best spot of the day for snorkeling off the Wai’anae coast. Q: Are there certain activities/specials that you add only for the summer season? A: We offer a “Child FREE” Special (ages 3-11) from July 1 to September 30, 2018. When guests purchase one adult ticket for our morning Wild Dolphin Watch cruise, they will receive one child’s ticket (a $40 value) for FREE! Plus, upgrades to BBQ lunch and snorkel are available for just $27. All year-round, dolphin sightings are guaranteed. If a dolphin is not sighted, guests can cruise again (meal and transportation optional). Q: Why is summer an especially good time for visitors to enjoy Hawaii’s snorkel cruises? A: Summer is an ideal time for snorkeling in Hawaii because this season offers the best water and weather conditions. During this time of year, it’s sunnier, the ocean feels refreshing and the waves are calmer. These conditions are perfect for snorkeling and seeing marine life. Q: What onboard amenities do you offer that are particularly noteworthy? A: The Dolphin Star is Oahu’s largest eco-friendly dolphin watching vessel and designed for amazing comfort. She features open-air, panoramic wrap-around decks with a shaded dining and bar area for guests to enjoy while having their lunch or sipping their “Blue Dolphin” cocktail. 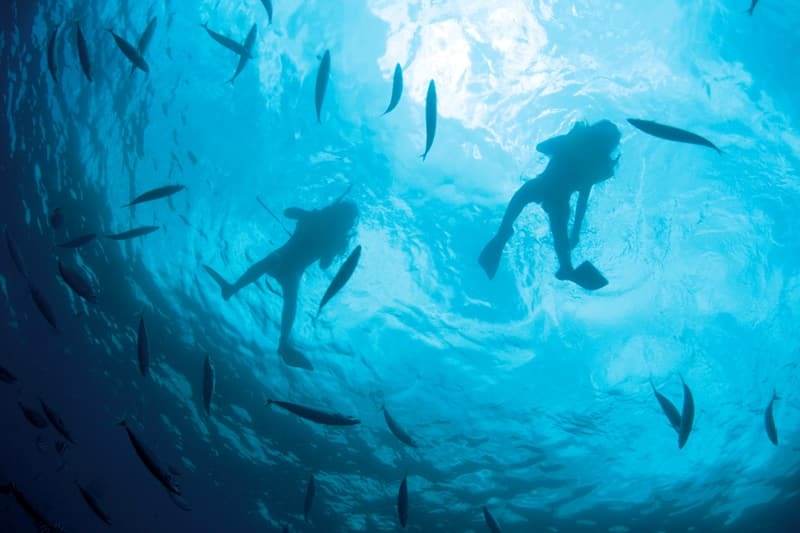 For snorkeling, we provide easy access to the water, freshwater showers for rinsing off and onboard restrooms, plus snorkel mask, fins, instruction and educational tours. Water you waiting for? Visit Dolphin-Star.com/wild-dolphin-watch3/ and book your Wild Dolphin Watch BBQ & Snorkel tickets today!